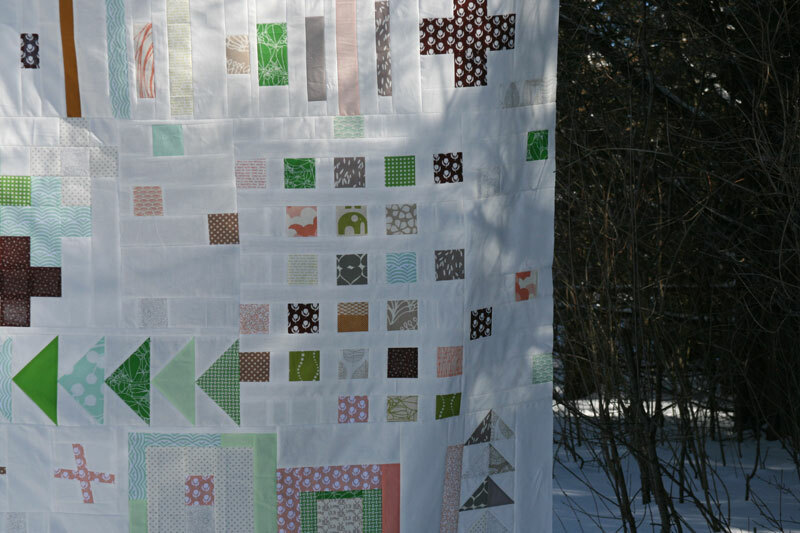 I started this quilt in December of last year, as a little look back at 2013. I put together many of the sections and had them up on the wall, and thought for sure I’d finish it at the very beginning of January. But then it sat. All it needed was for me to fill in all the sections with white, but blah… boring! I put it off for sewing that I found more enjoyable, all the while looking at it daily and thinking I needed to finish it. Each and every day I put it on my to do list, but each and every day I ignored it for something more interesting. I almost took it down several times, but knew that if I did, I’d likely never finish it. Recently I found myself really needing the design wall, so ultimately it had to be finished or removed, so finished it was (and to be honest, it wasn’t really all that much work, so I really should have done it sooner!). Anyway, the quilt! 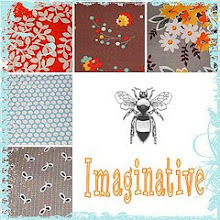 It’s made out of a fun selection of prints from Umbrella Prints’ Floating World, along with lots of coordinating solids and prints. The prints from this line are on a great quilting weight cotton, but are extra wide, so there’s lots of fabric to work with. I’m particularly fond of this peach print and this green one. They’re certainly colors I find lacking in my stash. 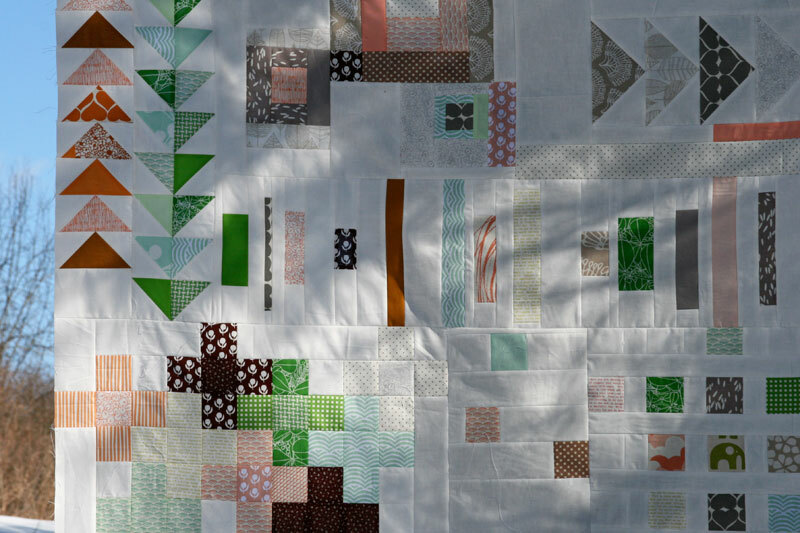 I thought it would be fun to make up a variety of sections for this quilt – a sampler of sorts – based on designs I used in quilts in 2013, so there’s a bunch of flying geese, some plusses, improv log cabins, wonky crosses, half square triangles and some strips here and there. I have the perfect green backing in mind (and right from my stash, too!) 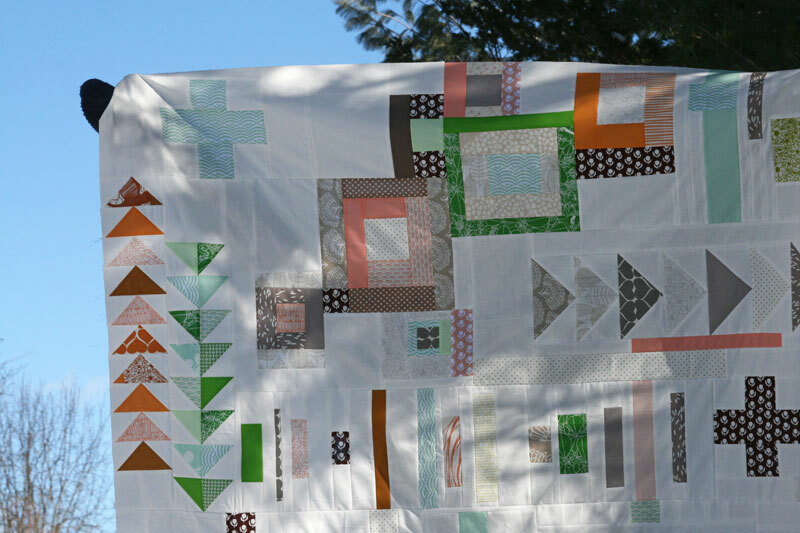 so hopefully this quilt top will become a real quilt before too long! 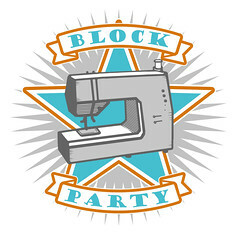 This entry was posted in Fabric, Posts about Quilts and tagged floating world, handmade, improv, plus quilt, quilt, quilt top, sampler quilt, umbrella prints. Bookmark the permalink. 22 Responses to off the wall… finally! I love it, so pale and interesting. Beautiful. Brilliant and beautiful. You must have studied under Frank Lloyd Wright? I really, really, really love your design and color combination! Well done! Fabulous quilt! Isn’t it funny how we put off things that are really not that much time or effort? Great job! I love the color scheme. 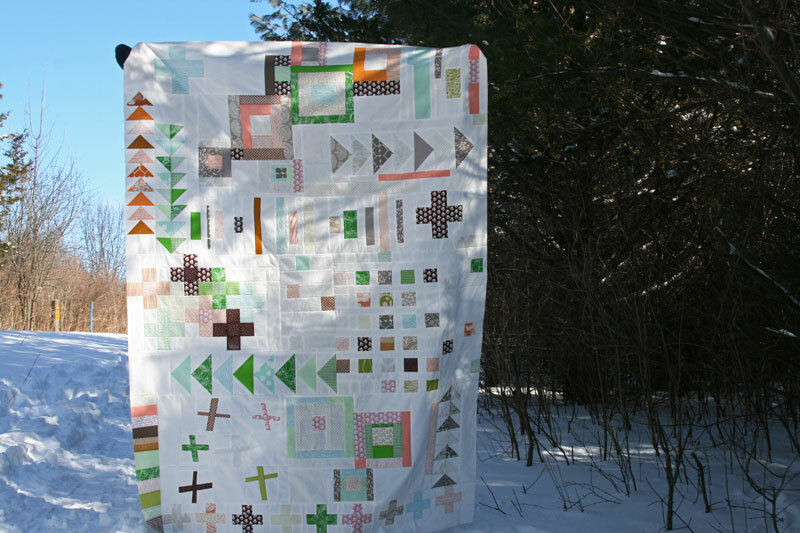 Love the complexity of the design and the idea behind it to include bits of the quilts you made last year, in a color scheme all it’s own. Very pretty. I too get stuck thinking something is going to take FOREVER and put it off, only to find out when I force myself to finish that an hour or two was all it needed. Ashley, I love it! I’m working on an improv quilt that revolves around some embroidery, and I have found myself just staring at it and wishing for your brain. You make improv look amazing, and like every part is on purpose. And I’m looking at my project thinking, “Gosh, I hope this isn’t a total disaster.” lol. Thank you for this dose of inspiration (coupled with a dose of envy). Looking cool! Love the pop of colors! Love this idea and it is a fabulous top. Can wait to see it finished! What a brilliant idea you had. I love the different sections. Love the improve look of the whole thing! I hate when I don’t finish something because I get bored with it. I find that happens often on a traditional quilt that I long arm for a customer. Love the first row, but after I have the design all figured out, I’m ready to move on to the next. 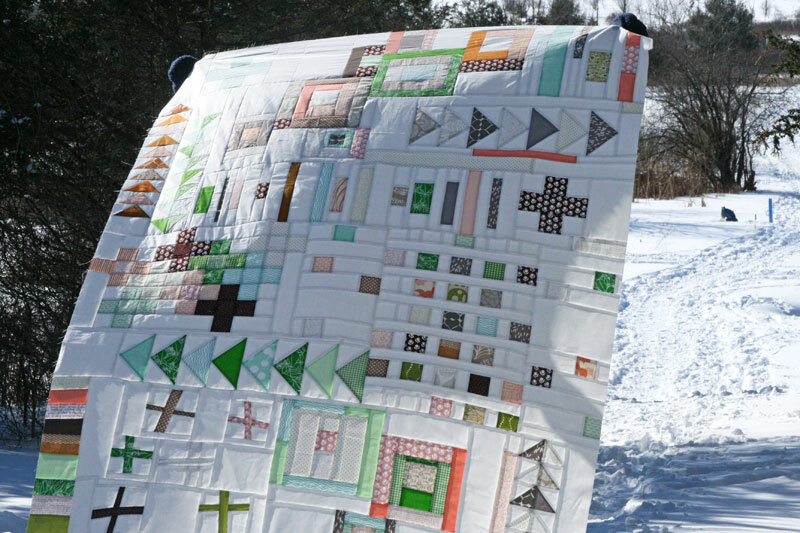 Modern quilts are a little different! I am crazy in love with your quilt! Just spectacular composition and use of color, fabric, design. It is wonderful to look at …over and over. I’d be so thrilled to create such an amazing quilt. Thanks so much for sharing. 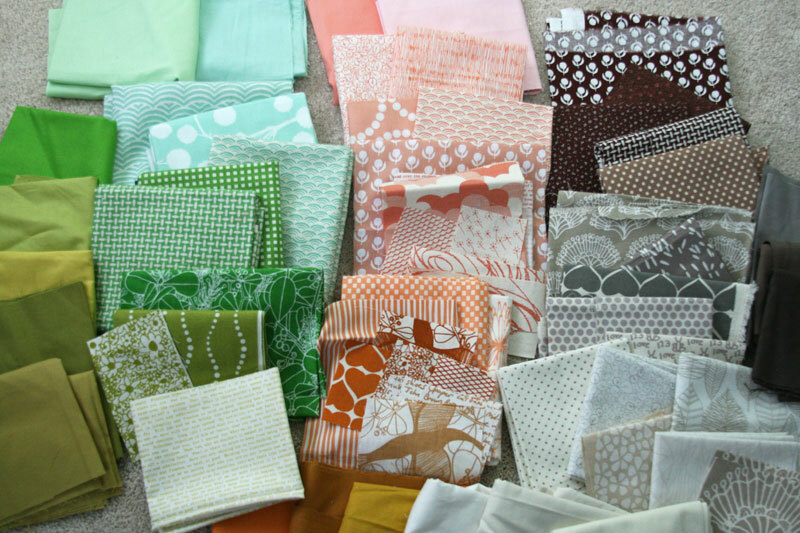 May have to dust off my sewing machine and get out my gianormous stash of fabrics! Well how fabulous is this! A nice diary if sorts from your previous projects. Well done! Beautiful job! And it looks so lovely photographed against the snow and the evergreen trees! I really love this color combination. Beautiful work! Oh, that is NEAT! Great idea.